The Creech 14 (missing: Sr. Megan Rice and Fr. Louis Vitale). Photo by Jim Haber. Las Vegas — On Thursday, January 27, activists charged with trespass, along with their supporters, filled Judge Jansen’s courtroom to hear his verdict regarding their April, 2009 protest at Creech Air Force Base. Crews at Creech control the drones used in the wars in Afghanistan and Iraq, killing civilians in remote controlled assassination attacks. 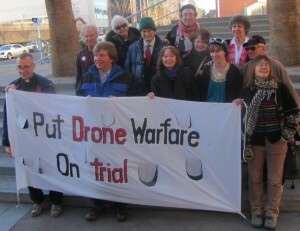 Before being sentenced, twelve made statements calling for an end to the drone bombings and for nonviolent ways of resolving international conflict. The Creech 14 were arrested during an April 2009 demonstration at Creech Air Force Base in Indian Springs, Nevada, protesting the remote piloting of armed killer drones from Creech in the wars in Iraq and Afghanistan. All were sentenced to time served. Although Judge Jansen had insisted that during the trial he would only hear evidence related to a relatively minor trespass charge, the case was groundbreaking because expert witness testimony was admitted and because Judge Jansen opted to take the case under advisement, write a written decision, and take three to four months to do so. The Creech 14 are: Fr. John Dear; Dennis Duvall; Renee Espeland; Judy Homanich; Kathy Kelly; Fr. Steve Kelly; Mariah Klusmire; Brad Lyttle; Libby Pappalardo; Sr. Megan Rice; Brian Terrell; Eve Tetaz; Fr. Louie Vitale; and Fr. Jerry Zawada. 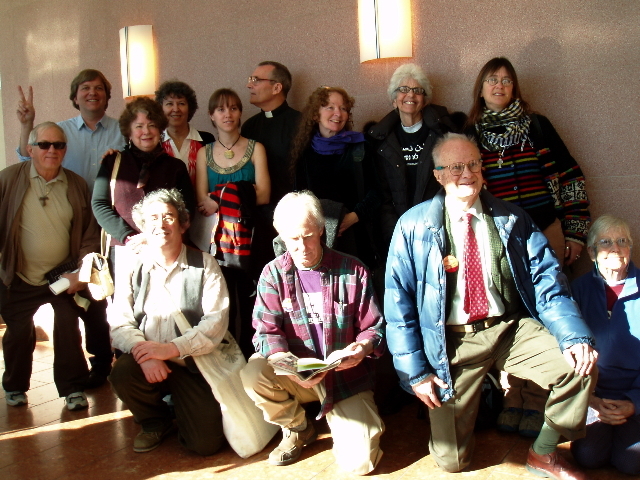 The Creech 14 (minus the jailed Fr. Louis Vitale) after their verdict. Megan Rice: I had to speak then, on April 9, 2009, as I do now, –the evil of killing and destroying people and lands 8000 miles away was and is emblazoned on my awareness. Human execution is fostered on the psyche of a nation….developing more and more nuclear weapons. I see that to allow more atrocities to continue is my real crime….I deplore the high tech technology of the use of any weapons for mass killing which destroy and pollute this sacred planet. I had to enter the base in order to obey higher orders. I have listened to the voice of the victims of drone warfare. “They are treating us like insects,” –said a man in Lebanon about the use of drone weapons. These weapons are aptly named drones, predators or reapers. My entry into any place was and is an absolute necessity. Thanks to all in this court who consciously or unconsciously are transformed as we listen and learn from the honest truth of history and reality. Brian Terrell: Thank you for your listening, the time you took to study and your thoughtful response. An airman at Creech wrote, “I am 7,000 miles away from the killing….I am 18 inches away from the killing.” He was referring to his proximity to seeing human beings dismembered on the video screen. The analogy is so close to the reality, it is the reality. Libby Pappalardo: We each have a responsibility to work for justice and to act in defense of human life. The US use of drones has increased hatred and violence in our world. I remember the families I met in the 70s when I traveled in Afghanistan. I remember how much they loved their beautiful children. Yet today after ten years of an illegal and immoral war the suffering and death are unimaginable. I have tried to work through the system. It isn’t enough. This is an emergency situation. Our country is worse off because of the violence of war and militarism. It’s necessary to take this next step. I will continue to struggle for human rights and nonviolence so that all the world’s children can feel safe and embraced by peace and hope. It is my prayer that you will come to the point where you will be with us in speaking this truth to justice, that one day our nation will lead the world in the attempt to turn swords into plowshares and learn war no more so that the god of peace, mercy, justice and compassion will bring about law and justice. I invite you and all those who are present in the court to join us. Please join us in our struggle to bring about God’s law and justice which are not in opposition to each other. Dennis DuVall: As a veteran, I care about our guys over there. Every time there’s a drone strike, most of the victims are innocent women and children and old men like me. The younger men are considered militants. Each attack results in revenge attacks, — results in building more IEDs in revenge for drone strikes. I was in New York City at the nuclear disarmament march on Times Square when a car bomb was almost detonated. It’s Ironic that I was protesting drone warfare at Creech AFB where they’re directing drone attacks and a year later I was almost an unwitting victim of a revenge car bomb attempt in Times Square. The young man who built the bomb, Faisal Shazad, says he was motivated by drone attacks against Pakistan. There is a greater harm. If this isn’t necessity, what the hell is? We cannot run from the consequences of our drone air war 7000 miles away. Eventually, it’s going to come home to us. We’re going to be the victims. Kathy Kelly: In Afghanistan, I met a family displaced by a drone attack in the Helmand Province. One man showed me the photos of his children’s bloodied corpses. The drone attack killed his spouse and his five children. In the Charahi Qambar refugee camp, I sat next to Juma Gul, a nine year old girl whose arm was amputated by the same drone attack. She was punished horribly even though she committed no crime. We want to be in solidarity with her. It’s criminal for the U.S. people to spend 2 billion dollars per week for war in Afghanistan that maims, kills and displaces innocent civilians who’ve meant us no harm. John Dear: I went to Creech mindful that I was in NY on Sept 11, 2001 and became the Red Cross coordinator for all the chaplains at the Family Assistance Center. New Yorkers know that war is not the answer. I’ve spoken to hundreds of thousands of people across the country saying that bombing Afghanistan is not the way to peace. In March 2009, Archbishop Desmond Tutu and I tried to meet with President Obama. The meeting was canceled at the last minute, and so I came with my friends to Creech on April 9, 2009. I could talk at length about why these drones are illegal, immoral, impractical, and why they are another form of terrorism and why they are bad politically and economically. But, they’re also bad spiritually. We went out on Holy Thursday. For me, it was an act of prayer. As a Christian, a follower of the nonviolent Jesus, I was praying for an end to war and a world without drones, and for new nonviolent ways to resolve conflict. I call on everyone in the country and world to do what they can to end war and drone weaponry and join this campaign for peace. Brad Lyttle: This court is part of a legal system which resolves disputes in ways that make people think that justice is being done. If the court resolved cases by pushing a button to send a missile far away to blow people up, and this is how it operated, our society would be in total chaos and people would be hunting down judges and assassinating them for not dispensing justice. We are attacking people in an Islamic country. We are shooting missiles and killing them in an arbitrary manner. It is generating great hatred, and these people have the means to access weapons to cause us tremendous harm. We need to establish peaceful, just ways to resolve disputes. This is the message I would like to have people examine and think about. We have to develop non-military means for achieving justice and therefore peace. Mariah Klusmire: I spent this week hearing about Afghan youth peace volunteers working for peace in their land. As long as they’re working for peace in their country, no punishment will stop me from working for peace here. Steve Kelly: I’m privileged to act with these people. I do have to make the connection for you that our presence at Creech Air Force Base was taking the remoteness out of the conditions of the necessity defense. Through our presence, we were trying to make the imminent danger posed by drone warfare less remote. We were making the necessary connection in the hotly contested areas. Our presence there was making the connection that would otherwise be remote. We weren’t there to do civil disobedience. We were there to make an intervention. Our intention was lawful. Although motive cannot be evidence our mental state or our mental intent was lawful. It’s in your hands and I appreciate the work that you did. I’m disappointed and saddened that you came to the wrong conclusion, but I think we can still get there together. Judith Homanich: As a follower of Jesus as my Lord and savior, I take seriously his second commandment, “love your neighbor as yourself.” As the mother of two wonderful children – my precious daughter, Sarah, who is just starting her adult life and my gone but not forgotten son, David, whose faith and courage and compassion continue to inspire me—I prayerfully acted in solidarity with all mothers, daughters, wives and sisters here and around the world who suffer loss due to war. My son David’s death, at age 21, was due to cancer not war, but I understand the heart wrenching life changing pain of losing a child, a loved one. The U.S. government kills countless innocents in drone attacks and calls it collateral damage. President Obama should heed his own words, spoken in October 2010 while in India. He said nothing ever justifies the slaughter of innocent civilians. But the U.S. drone attacks continue. While the drones destroy the bodies of our so called enemies in Afghanistan and Pakistan, men women and children – they also damage the minds and spirits of our own soldiers who operate them at Creech and elsewhere. This criminal long distance killing makes us all less human and less safe. I believe that I have a duty to bear witness and I will continue to do so. I have a duty to bear witness and I will continue. Jerry Zawada : For me it’s a matter of survival long before we were convicted by this court of trespassing there was another conviction that came into my life……as long as I have time left I want to take whatever risk is needed to say that we are all one family. The huge numbers of innocent people being killed by drones is something I have to stand up against. Our national policies have gone downhill. We think of people on the other side of the border or ocean as being different from ourselves. They’re not. That’s my family and your family too. We are one family. We have to take risks for one another. Judge Jansen: Before I pronounce sentence , … none of you were combative. I will insist I hope you continue to fight for your cause for diplomacy Mary Wright said the best way of doing it is through diplomacy. I know you each have a strong feeling for your cause…you have your own right to believe in your cause. In pronouncing sentence today I’m gonna give each of you credit for time served. The case is closed. I gave you a fair trial.